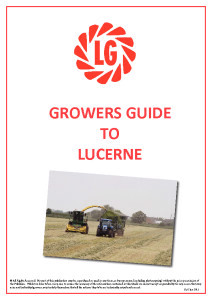 Mezzo Lucerne is an exceptionally high yielding Lucerne variety, brand new to the UK market. 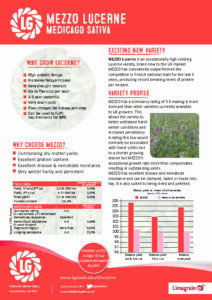 Mezzo has consistently outperformed the competition in French national trials for the last 3 years, producing record breaking levels of protein per hectare. A dormancy rating of 3.6 means that Mezzo can be considered for more northerly areas of the UK and Ireland. Mezzo is one of the highest performing varieties in French trials where the Lucerne market is far bigger than ours. 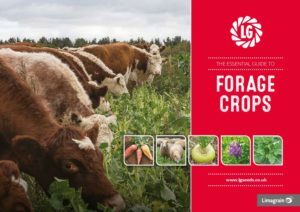 It offers exceptionally fast growth rate and outstandingly high yields of protein rich forage. Mezzo also offers a high resistance to all the main diseases and to nematodes. Mezzo can be clamped, baled or made in to hay, but is also suited to being dried and pelleted. Data from the CTPS, France.